An old friend asked us if we could help their partner install a new microwave studio-transmitter link (STL) as part of XHBJ's upgrade to ATSC high definition TV. Because of the short signal path to the Mount San Antonio transmitter, we chose a low-cost Trango license-free 24 GHz Stratalink system. The system can easily carry 100 Mbps bi-directionally—more than enough payload to carry HD video and control signals to and from the transmitter site. The system automatically adjusts its modulation and power characteristics to account for fades in heavy rain or fog. To keep the cost down, Cadena BC helped us by managing the importation themselves. On installation day, a partner climbed the enormous Televisa tower to the 50 meter level and mounted the transmitter site side radio. Some volunteers helped run the single power supply and IF signal coax from the transmitter room. At the studio, we found a shaky self-supporting tower, but Cadena supplied a father-son team to install the radio and small dish. A 24 GHz, you have a pencil-thin antenna pattern and it can be quite frustrating to find the signals when doing the initial aim. I had created an optical aiming tool to get the coarse aim before performing the fine azimuth and elevation adjustments. That seemed to help, but it still took some time to optimize the path. The crews were about to give up for the day, but I saw on the system logs that we had passed through the optimum aim. With just a little more adjustment, the path popped into place and the station began using the STL immediately. With the staff help, we got the entire project completed for less than $7,000 US. Signal Wiz can offer any, or all, of these services. We work with trusted partners to get your project completed on time and on budget. Give us a call at 858-349-9191 or send an email message to sales@signalwiz.com. 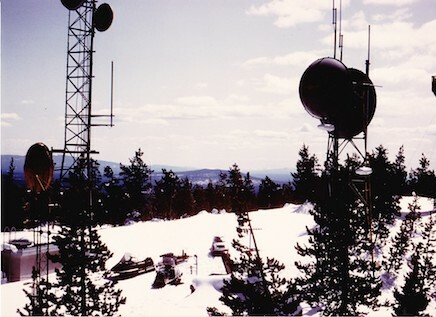 I was sold on IP microwave when a partner provided International Communications Network a bidirectional Part 74 18 GHz Trango Strata system for KSDY. With 100 Gbps throughput capability, we were able to not only send our multiplexed 19.3 Mbps ATSC stream up to the transmitter from the studio, but we could backfeed a backup satellite receive stream, and have plenty of bandwidth for control and status information and internet. Trango supplies VLAN isolation between the stream and other data, though you can choose to do that with an external router as well. Since 2012, we have yet to experience any downtime with the system, and when I needed to move the studio-side support one night, we were able to do so in minutes, using the built-in RSSI measurement port to optimize the aim. You can float the system on a conventional telecom 48 VDC battery system, and use SNMP to monitor system health. Signal Wiz can file applications, install equipment, maintain it, and train you. Give us a call at 858-349-9191 or send an email message to sales@signalwiz.com. Microwave has come a long way since then. We can pass a gigabit per second of data now with a well-designed system, and it will last for years without maintenance. I went through a certification class with Trango Microwave, but the principles apply to all makes of IP carrier-grade systems.